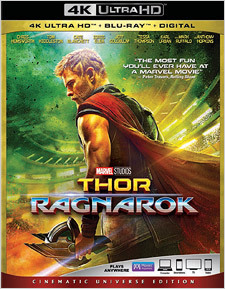 Directed by Taika Waititi (best known for the Kiwi vampire comedy What We Do in the Shadows), Thor: Ragnarok finds the titular hero (Chris Hemsworth) at something of a crossroads. His father’s time in Asgard has come to an end, and his brother Loki (Tom Hiddleston) has taken advantage while Thor’s been away searching for Infinity Stones. But Odin’s departure means the return of Hella (Cate Blanchett), his banished first-born daughter, who intends to take the throne of Asgard for herself and lead its forces on a ruthless campaign of universal conquest. When Thor tries to stop her, Hella expels him to the faraway junk planet of Sakaar, where he’s quickly captured by the Grandmaster (Jeff Goldblum) and made to fight a gladiatorial arena. His first opponent? None other than the Hulk (Mark Ruffalo), who’s been missing for two years. Now the pair must escape from Sakaar and join forces with Loki and an ex-Asgardian Valkyrie (Tessa Thompson) to defeat Hella and save the universe. Between Thor: Ragnarok, Doctor Strange, Guardians of the Galaxy, and now Black Panther, there can be no doubt that Marvel has its Cinematic Universe firing on all cylinders. If the superhero genre has, historically, felt a bit repetitive and constraining, forced to color itself within rigid lines using only Crayolas, it’s getting very hard not to be impressed by the sheer number of colors Marvel manages to find within its box. The studio has accomplished this, in part, by fully embracing its vast print archive of colorful characters and stories. Marvel has also recruited a unique and talented group of young directors for their films, to which Taika Waititi is an inspired addition. Waititi infuses a wonderfully mad and off-kilter sensibility into these proceedings, similar in tone to James Gunn’s Guardians films, yet uniquely its own thing. What’s more, his film is very much a nod to early Jack Kirby-era Marvel. The cast delivers here in a big way too. Watching a befuddled Ruffalo (in a Duran Duran T-shirt, no less) play confused straight man to Hemsworth’s armored but good-hearted bluster is a real treat; the pair gets serious comedy mileage out of the buddy picture/road movie vibe. Blanchett and Goldblum go so deliciously over the top here that they actually make Hiddleston’s Loki seem humble by comparison. Thompson is a great addition to the MCU, Anthony Hopkins takes a nice bow, Idris Elba returns in style, Karl Urban (Dredd) joins in the fun, and there are brief appearances by Benedict Cumberbatch, Zach Levi, Clancy Brown, Sam Neill, and even Matt Damon and Luke Hemsworth. No less than Mark Mothersbaugh, ex-DEVO, delivers the score. The film even features an opening battle sequence set to Led Zeppelin’s “Immigrant Song” – what’s not to like? Thor: Ragnarok was shot digitally using ARRI Alexa 65 and Phantom Flex4K cameras in the ARRIRAW (6.5K) and Phantom RAW (4K) codecs and was finished to a 2K digital intermediate at the 2.39:1 theatrical aspect ratio. That higher-resolution capture makes a big difference in the visual quality here, lending the upscaled 4K image a clean, crisp, and highly-refined quality, with no unwanted artifacting or noise. Check out the varied texturing of Sam Neill’s golden robes at about 11:30 into the film – it’s impressive. That detail is a little less apparent in the film’s CG visual effects, but the live action elements, especially close-ups, are superb. The presentation has also been given an HDR10 high dynamic range color grade and it too makes a big difference. The contrast is good overall, though the difference between the brightest brights and the darkest darks isn’t quite as big as it is on some other titles on this format. Still, the range of coloring is huge; this film has deliberately been designed to have a brighter, comic book appearance, with vibrant hues and subtle shadings alike. It doesn’t pop quite as much as Guardians of the Galaxy 2 on 4K Ultra HD (reviewed here), but this is a very nice image nonetheless. Audio on the 4K disc is available in a good English 7.1.4 Dolby Atmos mix (Dolby TrueHD compatible). Oddly, the audio level is a little low compared to the menu audio, so you’ll need to turn it up quite a bit and be careful once you have (and when returning to the menus). The mix is smooth and quite expansive, creating a very natural soundscape, but I wouldn’t call it particularly aggressive. Staging, directionality, and panning are all excellent, with lots of activity in the height channels, especially during battle sequences. But the bass, while certainly apparent, doesn’t have quite the punch and heft it might. This is a solid mix, and it serves the film well, but it’s far from showy. Additional audio options include 7.1 Dolby Digital Plus in English, Spanish, French, German, and Japanese, with English 2.0 Descriptive Audio and French 5.1 Dolby Digital (dubbed in Quebec). Optional subtitles include English for the Hearing Impaired, French (Quebec), Spanish, Chinese, French, German, Japanese, Korean, and Mandarin. The content here is less about the technical aspects of production and more about the Marvel universe itself and the process of bringing its elements to the screen and tying them all together. These features are also a good deal of fun, focusing as they do on the actors and their characters, both of which have become quite familiar over nearly twenty films now. Thor: Ragnarok is more off-beat than most entries in the MCU, so the tone of the extras reflects that. The commentary with Waititi is particularly appreciated; his personality shines through here as he offers interesting observations on his work. Of course, there’s also a Movies Anywhere Digital code included on a paper insert in the packaging. Thor: Ragnarok is the Flash Gordon of the Marvel Cinematic Universe. This is campy good fun, a rock ‘em sock ‘em, Technicolor superhero tale that deploys its characters well, features plenty of Hulk smash action, and seems to pack half of the stars in Hollywood into its 130-minute runtime. It’s also a pretty solid 4K Ultra HD experience. Recommended.